THE SHOWBIZ LION: X FACTOR'S BIG HONEY G AND STORMZY: A COLLABORATION ? X FACTOR'S BIG HONEY G AND STORMZY: A COLLABORATION ? IT looks like a collaboration could be on the cards for X Factor's North Weezey rapper Honey G and MOBO winner Stormzy. 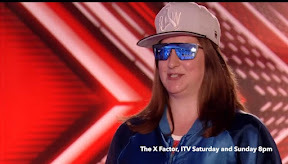 Big Honey G aka Anna Georgette Guildford from North London's Harrow stormed the X Factor auditions with her posh rap rendition of Missy Elliot's Work It. As fans almost broke the Internet after her performance, several contacted Stormzy to tell him about her performance. Stormzy who was about to take the stage in Reading replied: "Who is Honey G and why do I need to collab with him/her ?" He was told: "Tune into #XtraFactorLive on @itv2 right now and you will find out..."
Stormzy who was clearly enamoured by what he briefly saw said: "Ok lemme be a judge on your show, maybe not next year but 2018 lets do it... sick drop us an email late 2017/2018 and we'll chop it up, gonna catch up on the show later respect." Honey G, who shops regularly in Sainsbury's and is a managing director at an IT recruitment company meantime has admitted she never expected to get so much response to her audition. She said: "I never knew, I never expected to get this point, I never knew what to expect." To those who thought her performance was fake she added: "There's a lot of haters out there and haters are going to hate. Don't play hate, congratulate. I am about positivity." The jury is still out given her academic credentials in Linked In.